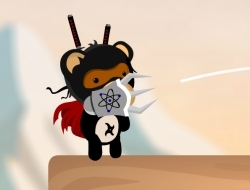 This is a fun skill game in which you will play the two ninja bears. They were relaxing at home and Purlpe Teddy wanted to play some Skyrim on his console, but the cables were all cut. They went down in the bear cave to investigate and they soon realised that there is a far greater danger. All their monsters have escaped from the prison and now they have to hunt them back. Each one of them has a turn in throwing stuff at the monsters. Use the weapons wisely, as each one does a different thing. The plain ninja stars will just knock out a monster, the ice ones will make anything slide on that surface, the gravity ones will invert the monsters making them float and many more others. Switch between your two bears and see which one should fire first and with what type of weapon. Use the mouse to aim and fire your ninja weapons. Ninja Bear 0.00 between 0 and 10 based on 0 votes.